Inter has won the Madonnina derby, defeating 3-2 at Milan's San Siro. Milan and Inter have donated spectacle to San Siro, a challenge that ended with five goals scored, only one winner - he is Inter. One goal was scored in the first half, four in the second. Initially, Matias Vecino scored for 1-0 in 3 minutes, which turned out to be the first half result. For 2-0 scored Stefan De Vrij in the 51st minute, Milan reacted through Tiemoue Bakayoko in 57 minutes, narrowing the lead at 1-2. 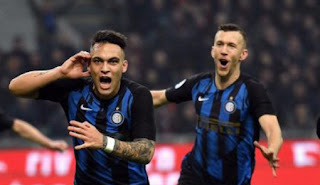 Inter returned again to the lead of two goals in the 67th minute, was the new Argentine striker, Lautaro Martinez, who scored 3-1 from the penalty. However, Milan reacted again immediately - narrowing the lead by Mateo Musacchios in the 71st minute, which scored for 2-3. In the crazy derby, where the two teams donated spectacle, there were still cases until the final whistle of the referee, but the gates were no longer shaken and Inter won 3-2 to occupy the third position with 53 points, two more than Milan.